To make enough roughly enough sauce for one box of gnocchi (I like the Zia Russa brand, Pastene seems fine as well): In a saucepan add 2.5 tbsp of butter, roughly 2 cups of canned Italian plum tomatoes (mash them up), and one half of one onion, peeled. I used red onion for its sweet sharpness. Choose a saucepan that is small enough so that the tomatoes cover or mostly cover the onion, ensuring maximum contact. Let this simmer gently for roughly 30 minutes. Stir on occcasion. As that's going, sautee some crimini (aka "baby-bella") mushrooms. I think the best method for doing so is to cook them whole because it saves their internal juices which are delicious once cooked. If you're asking: "mushrooms have juices?" it's because you've never had them cooked whole. That first bite into a whole button mushroom will reveal all. How to: You want to cut off the stem, but you do not want to take the entire stem out. Cut the stem where it meets the body, so that the mushroom will lie flat. If you remove the entire stem it leaves a crater, and out of that black gill-lined cavity the mushroom's moisture will exit while cooking. This would be no bueno. Anyway, once prepped, I first sautee them head down on high heat until the tops brown, then flip them over and lower the heat to medium-ish until the bottoms brown. Use a mixture of butter and olive oil to sautee with, the oil is there to raise the butter's burning temperature - if you sense the butter is burning, simply add more oil. For this recipe I used a tablespoon of butter and olive oil, for roughly 10 average sized criminis. How long you continue sauteeing the mushrooms depends on how cooked through you like them. Back to the recipe: Once the mushrooms are done, add the tomato sauce to the sautee pan, and simmer that for 10 minutes or so to marry the mushrooms and the sauce together. You can save or toss the onion, it's deliciously sweet at this point and I save mine, cut into big chunks. Some of the mushrooms I cut in half to release their meaty and earthy juices into the sauce. Do it in the sautee pan to conserve all that mushroomy nectar. Most mushrooms I leave whole for aforementioned reasons. Boil your gnocchi, when done add them to the sauce and grate a generous helping of parmigiano reggiano on top. 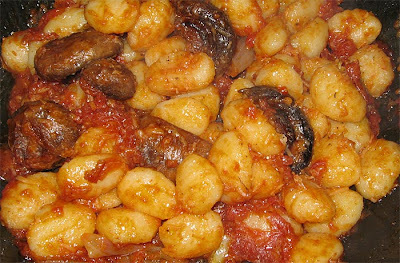 Add black pepper, and voila: tangy, rich, meaty, sensual gnocchi. The tang comes from the tomatoes, the richness comes from the butter (browned and onioned), and the meatiness comes from the browned mushrooms and their juices. The parmigiano ties it together. All on heavenly silky gnocchi. You'll have a hard time doing better than this.